Chinese Chess, known as "Elephant Chess" or "Xiangqi" (pronounced "Shiang-Chi") in China, is an ancient game nearly 2000 years old, and played by millions of people the world over. The game board consists of two sides: the "northern territory" (typically using blue pieces) and the "southern territory" (using red), separated by a space called "the river". Each territory contains a "king's palace", and the objective it to capture your opponent's king, while simultaneously protecting your own king. Each side starts with 16 pieces. Red moves first, and each side makes one move at a time. Although played by Chinese people around the world, until recently it was virtually unknown among westerners. Chinese Chess is a relative of western Chess, but the many differences result in a more wide-open and aggressive contest. When you think of chess, you probably think of the strategy game played throughout Europe and the Americas. There is another kind of chess played throughout the world by probably more people than any other strategy game. That game is Chinese Chess. 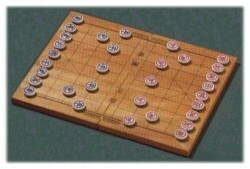 The "Elephant Game" as it is called by the Chinese, dates back more than 2000 years. A cousin of Western Chess, its unique style of play results in a wide-open, quick-moving and aggressive contest. Chinese Chess for Beginners explains both the rules and the strategies of the game clearly and in detail so that you can start playing right away. It covers everything from the opening through the endgame. The book includes a set of paper chessmen that you can cut out and begin to play right away. This book provides everything that the beginner needs to know about the fascinating game of Chinese Chess. The initial chapters explain the basics of the game. Subsequent chapters show how play is developed and offer advice, as well as giving tips, on strategy and improving your skill. Finally, there is a brief history of the game and additional reference material. This pack contains a detailed play guide and strategic hints and tips for the game, along with a colorful board and the 32 pieces used in play. 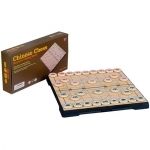 You can also play Korean Chess using this board and pieces. H. T. Lau introduces Chinese chess to Westerners, discussing issues such as the board, the movement and values of the pieces, and basic rules for capturing and defeating an opponent with the aid of 170 diagrams. Suggested end games and opening strategies are given as required reading for the beginner. Finally, this artfully simple book concludes with two appendices devoted to the elegantly constructed games found in "The Secret Inside the Orange and "The Plum-Blossom Meter, two classic seventeenth-century works on Chinese chess. C. K. Lai is a well known Xiangqi player and enthusiast who has written and translated a dozen books on the subject, among them Chinese Chess, An Introduction To The Openings, Checkmate In Two, and Chess Of The Wuzhi Mountain. With a few Xiangqi friends he promoted the game in Britain some two decades ago, helping to create the UK Chinese Chess Association. He is certainly at the forefront of promotion of the game in Britain. One of C. K. Lai's high achievements in Xiangqi competitions was in 1994 when he won the 11th European Xiangqi Championship held in Amsterdam. He also won on several occasions the UK Xiangqi Championship. He is Editor of Chinese Chess Cyber Newsletter, which attracts many Xiangqi followers. If you're familiar with the Western game of chess, you'll find much that is familiar in Xiangqi, but also much that is strange and new. This web site will help you to sort out the differences. A Chinese chess teaching ptrogram. The computer challenges your techniques and provides many computer players with different levels. Whoever you are, beginner or expert, you will have fun playing against it. It also learns from your good moves, so be careful! Play Chinese Chess / Xiangqi / co tuong / cotuong online with other people. An online encyclopedia article on Xiangqi, from the Wikipedia. Includes background, rules, and links. Xiangqi fits in at Boardspace as a little known classic game. I presume that a billion or so Chinese would disagree about the "little known". I hope boardspace can make it more acessible to the rest of the world. This portion of the Chess Variants site includes information about Xiangqi, history of the game, rules, links, and much more.